Open Monday through Thursday, 7:30 a.m.-4:00 p.m. and Friday, 7:30 a.m.-3:00 p.m. The Information Commons opened in September 2016 after completion of Phase I of its $1.2 million renovation. The project has transformed the former library into a place where students can exchange ideas and collaborate on academic projects. 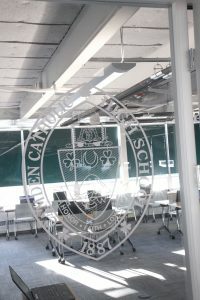 The IC now boasts a large classroom space, several smaller meeting areas, presentation areas, and individual quiet nooks. This transformation reflects an international shift in the use of library spaces. Libraries were traditionally built for learning and research space and although this style of learning was amenable to past generations of students, businesses today are looking for critical thinkers, problem solvers, and collaborative learners. One of the highlights of the project is the Ms gr. 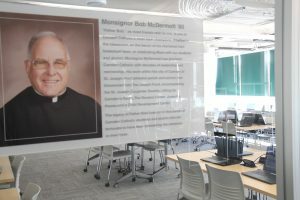 Bob McDermott ’60 Collaborative Learning Center, a classroom fitted with computers for all students and audio-visual equipment to enhance the critical thinking experience. Teachers use this space for collaborative and active learning to promote student-driven discovery, inquiry, and innovation. Msgr. 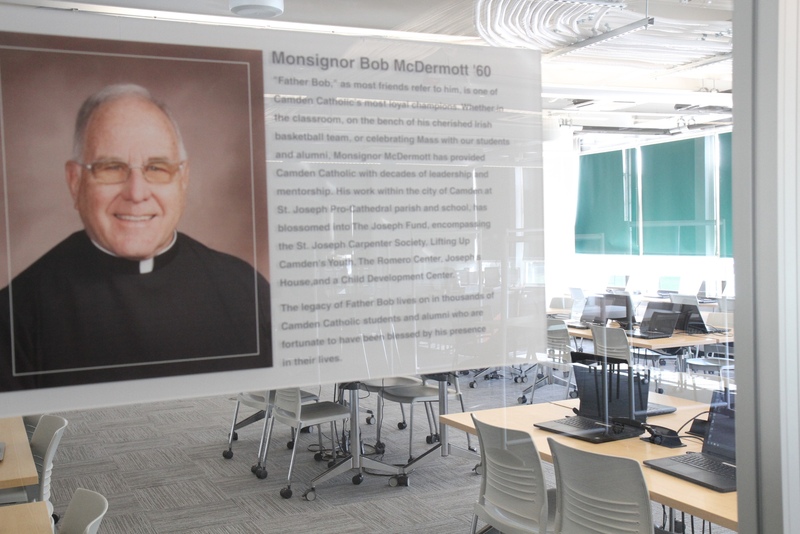 McDermott is one of Camden Catholic’s most proud and consistent champions and a Catholic school educator himself. He is an exemplary alumnus who continues to live by the Camden Catholic ideals of Honor, Faith and Loyalty. The CCHS Information Commons has many AP, SAT and ACT study resources in print. Ask Mrs. Murphy or Mrs. Szurek if you need help finding them!